What are the things that affect the reaction time of pupil light reflex? What I mean to say is, if you are in a bright room, and the light suddenly turns off. The time you spend to see things in the room (i.e.., night vision) is the reaction time. Pupil responses have little effect on dark adaptation. It is the retinal processes that govern the bulk of the dynamic range of the eye's light sensitivity. This change is called dark adaptation and refers to the process by which the eye becomes more sensitive to light under conditions of reduced illumination. [C]ones are primarily responsible for resolving fine detail (acuity) and colour vision in good light, while rods allow us to see more effectively in dim lighting conditions. The recovery of sensitivity in dark adaptation involves the regeneration of photoreceptor photo-pigments as well as neural changes. See figure 1. The rods are way faster in gaining sensitivity than the photon-hungry cones. In a typical clinical setting for diagnostical purposes of e.g. 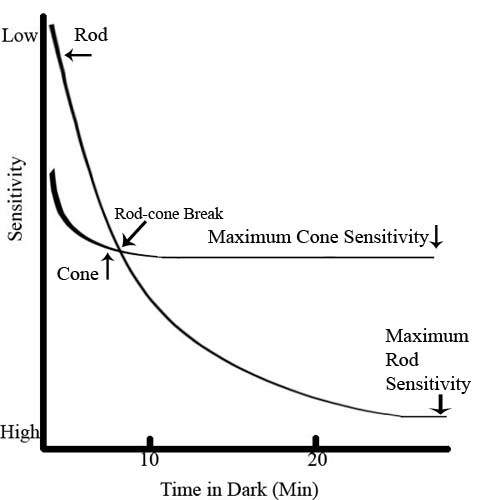 rod function, a typical dark adaptation period is about 20 minutes or so, which fits the below graph quite well. At the end of dark adaptation, the eye is about 100,000 times (i.e., 5 log units) more sensitive than it was at the beginning of the test, a level called dark adapted sensitivity (Universty of Calgary). In contrast, the pupil response has only a minor effect on light sensitivity in dark adaptation. It does change its diameter in the dark for sure, but the amount of light that passes through doesn't change too drastically. Pupil diameters range between about 2 and 8 mm (Spector, 1990), say a factor of four. In terms of surface we are talking about 3 and 50 mm2, respectively using (pi*r2), hence a factor of 16, as opposed to 5 orders of magnitude in the process of retinal adaptation. Not the answer you're looking for? Browse other questions tagged human-biology neuroscience neurophysiology vision or ask your own question. What is the difference between a circular and a cat's-eye (slit) pupil? Why do we go blind for a few seconds after switching off the light?